The Snom D785 joins Snom’s D7-series of IP desk phones. 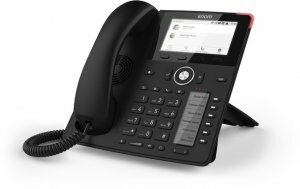 This high-end handset supports up to 12 SIP accounts and has a built-in two-port Gigabit Ethernet switch for high speed connectivity. Featuring a large high resolution 4.3″ TFT-colour display, the D785 has 24 self-labelling programmable function keys (6 physical) with multi-coloured LEDs for visual call indication, providing users with increased visibility and efficiency. Complete with integrated Bluetooth and USB connectivity, the Snom D785 offers users a variety of functionality enhancing features including the use of a USB corded or Bluetooth headset, connection to the D7 expansion keypad or WiFi. Along with other models in the Snom range, the D785 has an intuitive user-friendly menu as well advanced remote management and provisioning capabilities making it the perfect companion for users requiring cutting-edge design, high-end functionality and unprecedented HD audio quality. Choose Computer Network Services Ltd as your preferred provider of your next Business Telephone System. Be assured you are getting the right system for your business today and tomorrow. As a 3CX Platinum Partner we have the skills and the ability to install and maintain your system having deployed systems to small and large organisations throughout the East of England and London. *Buy 10 + 2 Free offer only applies to Black handsets.